Nowadays, doing presentations with PowerPoint becomes more and more popular in daily life. To make PowerPoint slides more vivid and attractive, embedding videos in it is trending these days. It is easy to embed normal videos in PowerPoint but embedding a YouTube video in PowerPoint requires some efforts. The best and most cost-effective way to embed a YouTube video in PowerPoint is download YouTube videos using a powerful and professional downloader and then add the YouTube video in PowerPoint within several clicks. Since YouTube is the most popular and widely recognized video sharing website, many media sources can be traced and shared on YouTube, and demands for downloading videos from YouTube are huge. In this case, Leawo Video Downloader is developed to help users to download videos from YouTube as well as other video sharing websites in a professional and efficient way. With this program, users are allowed to download YouTube videos free and the downloading speed is 6X faster than other downloaders. In terms of file quality, Leawo Video Downloader offers two downloading options of 720P and 1080P HD for users. The downloaded video can be directly played within the built-in media player, converted to other formats using Leawo Video Converter, or put in other use, for example in this case, put YouTube videos in PowerPoint. The following describes a step-to-step guide on how to download YouTube videos with the help of Leawo Video Downloader. Click to download and then install the program. It takes only a few minutes to finish the downloading and installation. If you need a Mac version, turn to download the Mac version. Step 2: Find your desired videos from YouTube. This program saves you a lot of time as it offers a built-in searching engine in the downloader page. Just paste the URL in the address bar so that you can directly locate your desired videos on YouTube. Step 3: Download videos from YouTube. 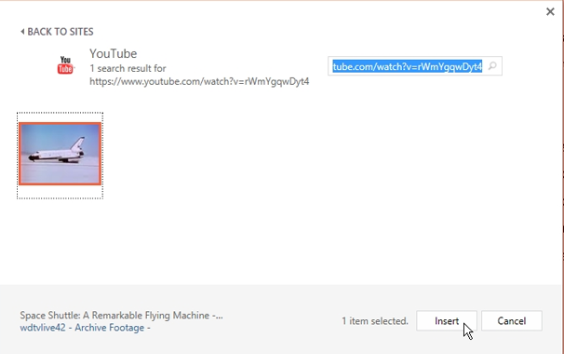 After searching the desired videos on YouTube, click the download icon to start downloading the target video. You can download a bunch of videos at a time. After the video is successfully downloaded, you can find them from the “Downloaded” tab. Now if you want to add a YouTube video in PowerPoint, you can insert it directly to the PowerPoint slide without any disturbance. Leawo Video Downloader requires to download videos from YouTube first and then you can add a YouTube video to PowerPoint as a local source, instead of that, you can also insert a YouTube video to PowerPoint as online video. To let you get familiar with the procedure of inserting a YouTube video to PowerPoint slide, the following instructions are given for your reference. Step 1: Locate the desired video from YouTube. Copy the link. Step 2: Launch the PowerPoint, select the slide to insert the video. 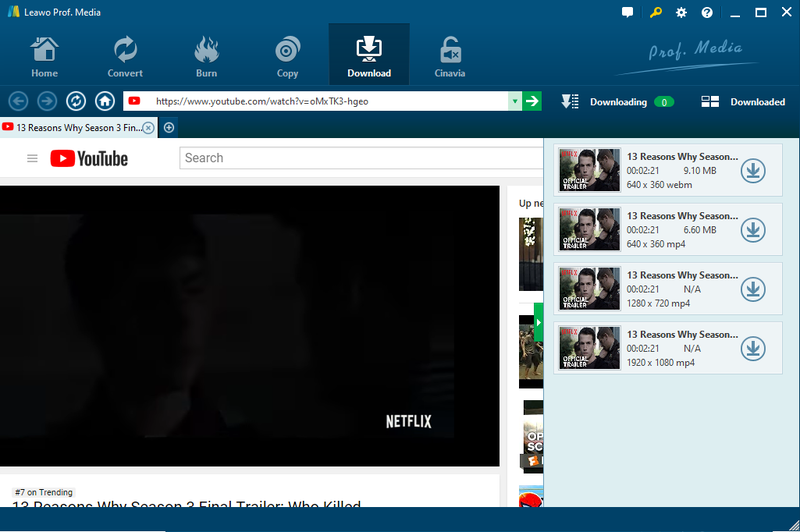 Click Insert from the toolbar, choose Video > Online Video. Step 3: Paste the link on the address bar and then click the search icon. 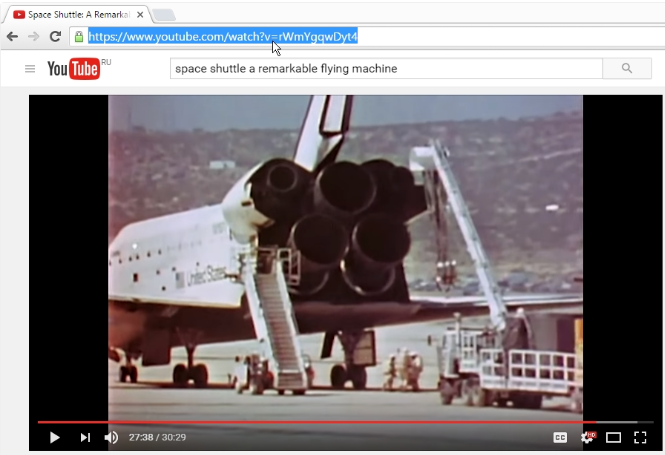 Step 4: Click Insert in the bottom after the video is located and displayed on the page. Now you can see that the video has been successfully inserted to the PowerPoint slide, where you can resize the window for the video based on your preference. If you need to embed a YouTube video to PowerPoint with an embed code, it is easy to achieve by following the below steps. Step 1:Instead of copying the link for desired video, click “Share” > “Embed” under the video, and copy the string on the box. Step 2:Launch PowerPoint and move to the slide where need to add the video. Under the “Insert” tab, choose “Video” > “Online Video”. 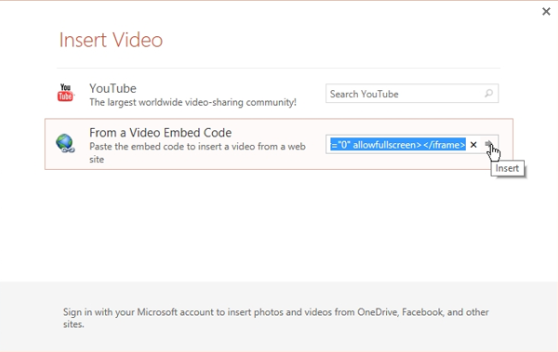 Step 3:Choose “From a Video Embed Code” on the displayed page. Paste the string that you just copied to the box and then click “Insert”. Now you can see the video being embedded to the PowerPoint slide. Embedding a YouTube video in PowerPoint can be achieved by Leawo Video Downloader to download videos from YouTube, and then you can insert the YouTube video to PowerPoint for demonstration during presentation. 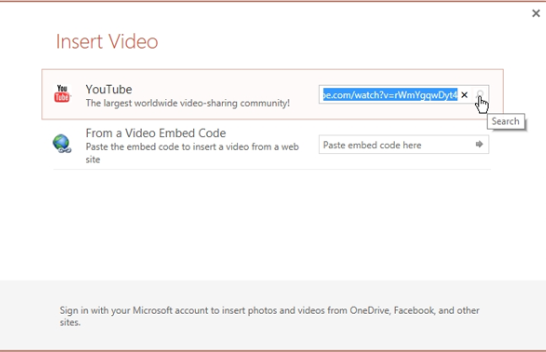 You can also insert a YouTube video to PowerPoint using an online video or embed code. If you choose some online downloader to download videos from YouTube, it is much more time consuming as a lot of malware or adware will pop up from time to time to disrupt the downloading process to some degree. Furthermore, speaking of video quality, it is better to download videos with the help of Leawo Video Downloader as it supports users to download videos in 720P and 1080P HD. A video in PowerPoint will definitely highlight the presentation effect and an efficient downloader also highlights the video quality and downloading speed, making the presentation even more eye-catching. Don’t you think so?